Make no mistake about it, the drive across Wisconsin on US 51 is long and tedious, and it’s even more challenging when it’s pouring the rain the entire day. Thank goodness there are some interesting things to see along the way. The landscape isn’t terribly exciting, but you will get the chance to see the World’s Largest Talking Loon and the World’s Largest Penny, as well as a handful of neat little towns along the way. US 51 begins on the Wisconsin side of the Wisconsin/Michigan border, near Ironwood, Michigan. My route followed US 51 south until it turned into Interstate 39 around Wausau, then continued to Stevens Point, where I turned onto US 10, then US 45, and finally, Interstate 41 to finish the drive into Milwaukee. It’s a total distance of about 310 miles, not counting sightseeing detours. Just as I expected, Day Eight began with an unrelenting pouring rain. I had a lot of distance to cover and not much of a choice about it, so I got soaked as I loaded up the car at my motel in Ironwood, then started counting down the miles. You can see it all in the Drivelapse video at the bottom of this page, but it’s not spectacular. Officially named Claire d’Loon, this big bird weighs a ton and stands 16 feet tall. 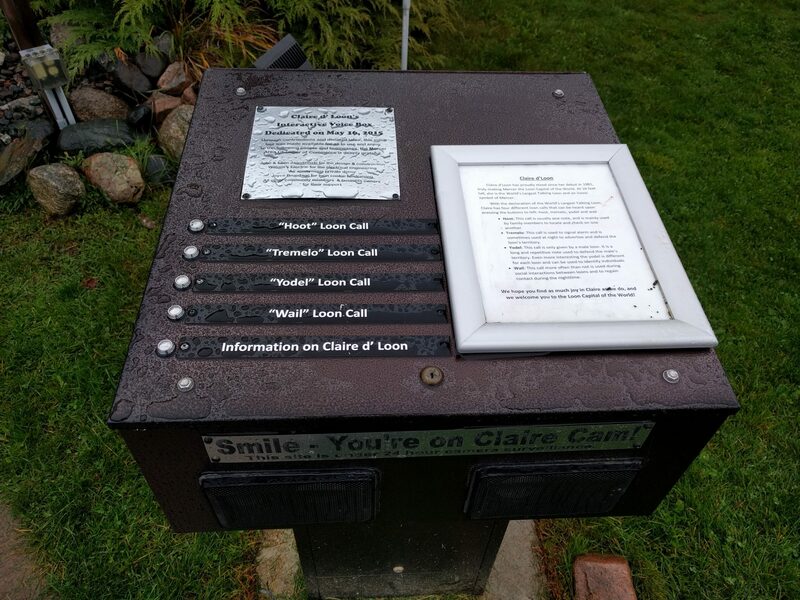 You can’t miss Claire – she’s located at the side of US 51 in Mercer, which is only about 23 miles south of Ironwood. That’s right, I only made it 23 miles before finding an excuse to stop. Claire would be an otherwise unspectacular statue, if not for her ability to speak. There’s a box near the statue with buttons that are supposed to trigger a loon’s hoot, tremelo, yodel, or wail. I pushed the buttons, but heard nothing. Maybe the rain got the best of Claire. 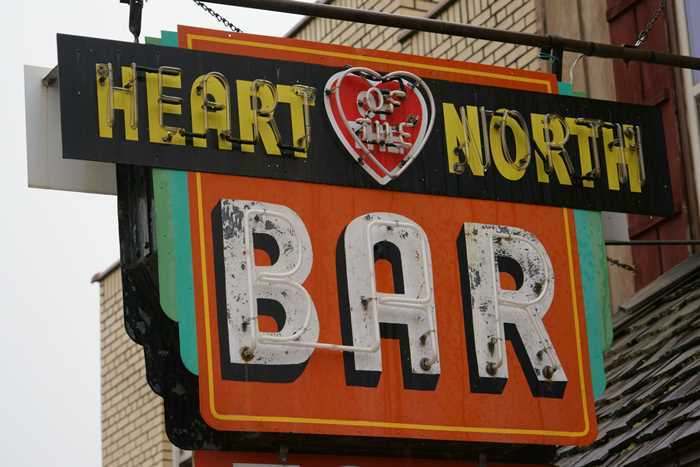 Elsewhere in Mercer, I did spot this very nice neon sign. Aside from that, it’s a pretty small town, and you can see it all in just a few minutes before moving on down US 51. You’ll pass through a few more small communities before reaching the next big town, about 30 miles south of Mercer. Woodruff and neighboring Minocqua feel pretty big, even though they’re both quite small. I’m pretty sure, on a sunny day, Mincoqua would be a beautiful place, thanks to its location on a peninsula in the middle of Minocqua Lake. 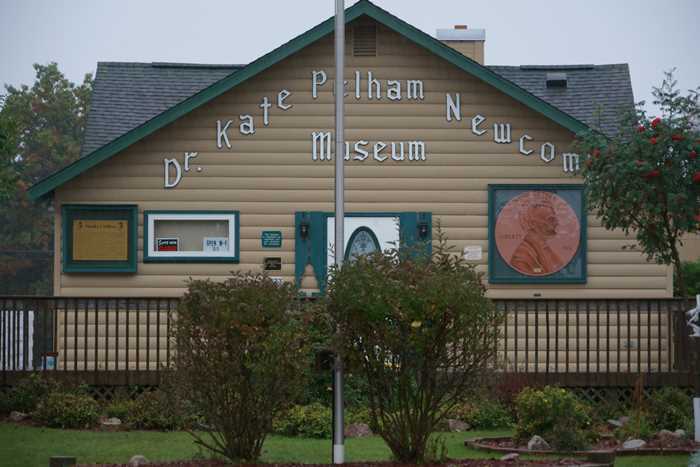 The most notable thing to see in Woodruff is the Dr. Kate Pelham Newcomb Museum. Dr. Kate was a frontier doctor from the 1930’s until her death in 1956, known as the “Angel on Snowshoes” for her determined efforts to reach patients during the harsh Wisconsin winters. The museum is housed in her old office. Dr. Kate famously organized Woodruff’s “Million Penny Parade” in 1952, to raise funds for a new hospital. More than a million pennies were raised from all around the country within 100 days, and a big parade was held on Memorial Day, 1953 to celebrate the accomplishment. So is that the world’s largest penny on the wall? It doesn’t seem all that big. That’s what I thought as I took this picture from inside my car in the pouring rain. I did some quick searches online, which seemed to suggest that the World’s Largest Penny was located at the Dr. Kate Museum, hanging on the wall outside. But it turns out, that penny is just your everyday, run-of-the-mill big penny. The World’s Largest Penny is located a block away, at the corner of 3rd & Hemlock (two blocks south of US 51, behind the Krist gas station). The town of Woodruff needs to do a better job of directing tourists to its biggest attraction. I had trouble finding the Dr. Kate museum in the first place, and there was no signage pointing towards the actual World’s Biggest Penny, or explaining that the penny on display at the museum is not the penny everyone is looking for. I stopped for lunch at the Culver’s off US 51 in Merrill. It poured the rain while I was inside, eating chicken and searching my phone for interesting places that could give me a break from driving in the rain. I saw that downtown Merrill was just a short distance away, and it had a few promising antique stores. So, I headed into town. Merrill has a great small-town Main Street business district that includes the towering Lincoln County Courthouse, completed in 1903. 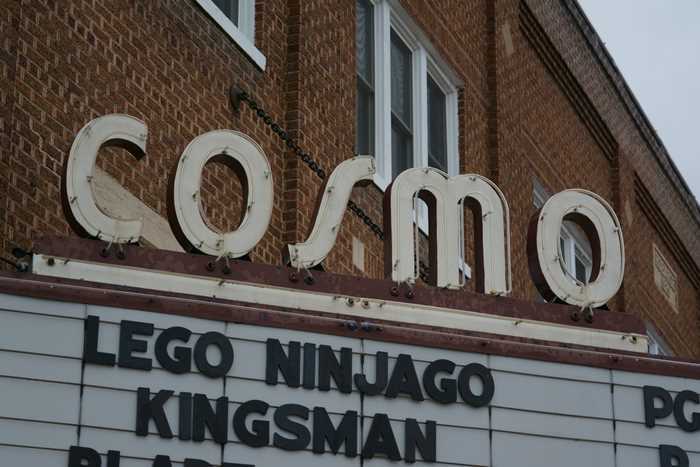 The Cosmo Theater on Main Street has a great marquee. It’s still open for business and showing movies. 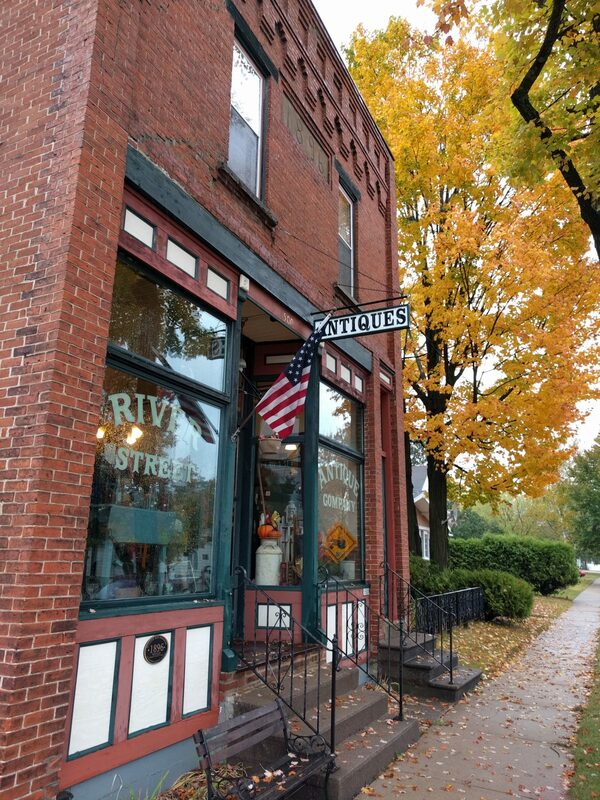 When in Merrill, I suggest checking out River Street Antiques. It’s a block south of Main Street and a few blocks east of downtown. The store is packed with neat stuff and run by friendly people. By the time I left Merrill, the weather was improving slightly (drizzle instead of pouring rain, then eventually just a lot of clouds). I drove through Wausau but didn’t see anything worth photographing (although you can see it in the Drivelapse video below). The next stop that involved any actual exploring was Oshkosh, Wisconsin, about 120 miles south of Merrill. 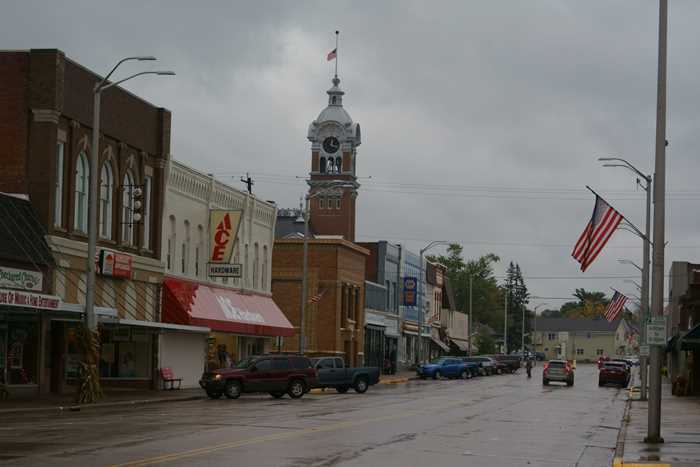 The drive through Wisconsin on US 51 is a necessity, but it’s still a nice drive with several interesting little towns. 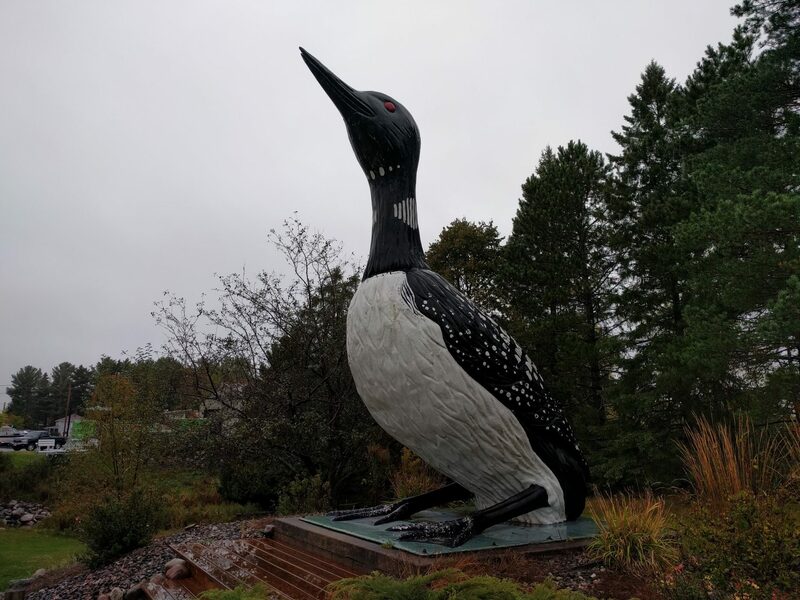 Take plenty of breaks and do some exploring as you travel the highway, and be sure to see the World’s Largest Talking Loon and the World’s Largest Penny.